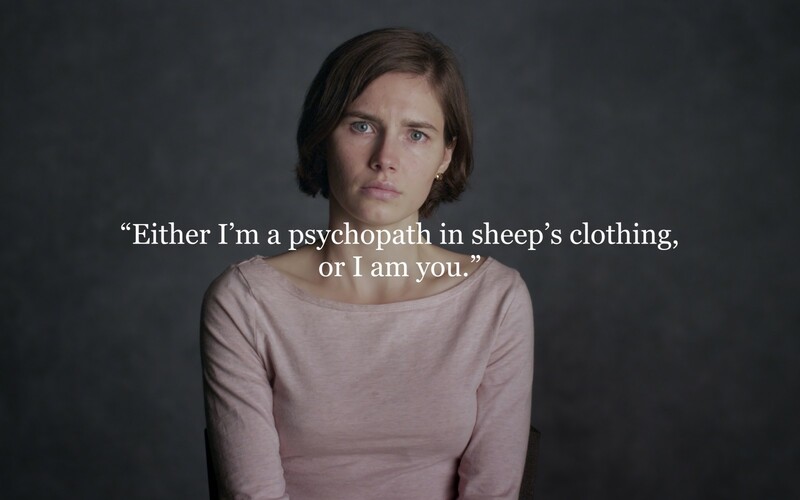 Whether you believe she was wrongly accused or completely guilty, everything surrounding Amanda Knox is sure to change what you thought you knew about guilt, the justice system, and innocence. If I'm guilty, it means that I am the ultimate figure to fear. Because I'm not the obvious one. If I'm innocent, it means that everyone is vulnerable. And that's everyone's nightmare. There are those who believe my innocence and there are those who believe in my guilt. There's no in between - either I'm a psychopath in sheep's clothing or I am you. She went to Italy to learn the language. Well, she learned the language. This is impossible, this is impossible, this is a nightmare, this can't be true, it's not fair, it's not fair. I think everyone’s reaction to something horrible is different. I didn't realize in the beginning how much attention was being put on me, and how very intensely I was being scrutinized. I thought that being myself was enough. I was young enough to think that insecurity disappeared with maturity. First I showed not enough emotion; then I showed too much. Suddenly, I found myself tossed into this dark place. I thought about suicide. I thought about all the ways that I could do it. Me not coming home again until I'm in my 50s, until members of my family have died - I was poisoned. I don't think about my future, my life, anymore. "I just think about what I have to do next month. For me, whatever happens after next month, even the world can be destroyed, but I don't think about next year or anything. I think I'm trying to explain what it feels like to be wrongfully convicted - to either be this terrible monster or to be this regular person who is vulnerable. I want you to know that I'm OK because I'm not dead inside, I promise, and I don't want you to be dead inside. When the other prisoners said well done to her, she started jumping for joy. If they're guilty and earthly justice didn't get to them, I hope they own their guilt because I know that life ends with a final trial. No one will get off Scott free. Their lives have been disrupted as well. It is very upsetting either way. Last year we were pleased but not celebrating. This time it is the same. We don’t have any answers. This is a failure to find justice for Meredith. She deserved so much in this life. I'm the lucky one. The victim is Meredith Kercher, but there are other two victims who are alive. I would like to be reconsidered as a person.